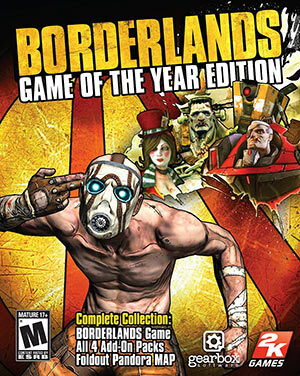 Gaige is one of the playable characters in the Borderlands II shoot ’em up video game. 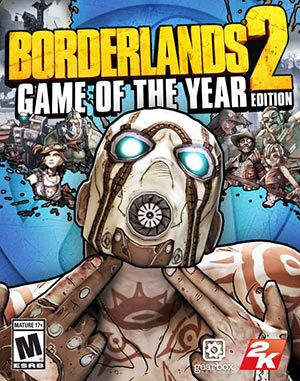 Borderlands II was a major release, noted for its quirky dialogues and setting. It is also the game who dares ask the following question – EXPLOSIONS!! For more context about the Borderlands setting and profiles, see our Lilith profile. Real Name: Gaige (last name unrevealed). Other Aliases: Mechromancer (her ECHOnet handle). Height: 5’3” Weight: 92 lbs. Age: Gaige is supposedly 18. Yeah, right. Gaige is a technological genius who has taken several levels in the Mad Scientist prestige class. Her specialities are robotics, cybernetics, and high energy shields and weapon systems. Despite her youth she has already developed an arsenal of inventions. And they all have clear combat applications – making Gaige a one-girl fighting force. Her left arm is visibly robotic. It is superhumanly strong, and houses all the cybernetics and emitters to digistruct and control her combat tech (including her killer robot). If she hits stuff with her arm Gaige will usually wield a hammer, a wrench or somesuch, though the main effect is to give her slightly more reach. Gaige alleged that her arm can smash concrete, which seems exaggerated. Anarchy charging. The “Anarchy” system (so named because it sounded cool) increases the muzzle velocity of Gaige’s gun as combat goes on, through an acceleration buildup system. As power increases, Gaige’s gun becomes uncontrollable due to recoil and increasingly haphazard ballistics. So mostly she points her artillery in the general direction of the enemy and maniacally pumps the trigger. Most bullets aren’t going to hit anything but the scenery, but those that do really hurt. “Close enough” guided projectiles. To partially compensate for that, Gaige can charge her projectiles to have them magnetically self-aim. They need to hit a hard surface for their built-in force field to send them ricocheting away in the direction of an opponent being painted by one of the designators in Gaige’s robotic shoulder. This makes accurate aiming even less necessary, especially indoors. 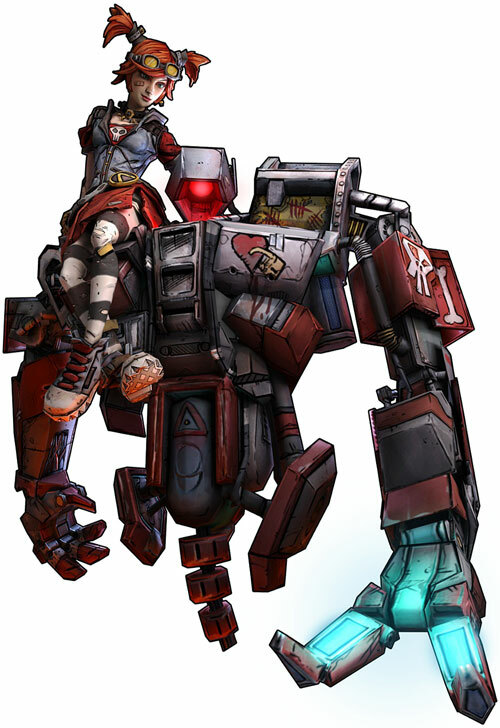 The also-dramatically-named “blood-soaked shields” are a tech that draws energy from fallen opponents to rebuild the capacity of Gaige’s high-performance, hand-tuned orb shield. Perhaps it siphons the batteries of her opponents, but it only works if they’re not moving. And perhaps most Pandora creatures are sufficiently mutated to serve as an energy source when killed. The “Cookin’ up trouble” system (CUTS) is a hacked combat medical system that leeches energy from a fully charged gun to power wound-treatment nanobots. Since we assume that Borderlands orb shields prevent grave tissue damage even when depowered, it is sufficient to keep going even after multiple hits. The “Sharing is caring” kit (SICK) creates an illegal copy of whichever orb shield Gaige has equipped on her Deathtrap killer robot. But remember kids – software piracy is a mortal sin ! 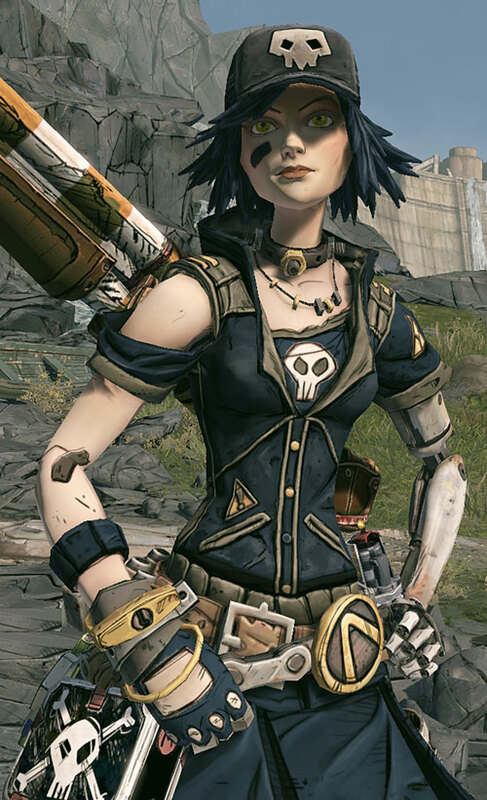 Gaige’s typical main gun is a Jakobs brand coach gun. It is an over-under or side-by-side shotgun of a very robust make favouring sheer power. Though it’s twin-barrelled, Gaige’s hands are too small to load two of its big shells at once. So it’s effectively one-barrelled. But then it can be hinged open and reloaded very quickly. This is a close-quarter weapon with a low effective range, due to the video game-style buckshot dispersion. Her backup gun is usually a Torgue brand assault rifle. These shoot gyrojet projectiles – heavy, relatively slow micro-rockets with mediocre ballistics but packed with explosives. In her hands it has but a marginally longer range than her shotgun due to lack of accuracy. But it gives her two different ammunition pools to draw from and digistruct. Run around giving everything that moves a faceful or three of buckshot at melee range. Hurriedly retreat once her orb shield is down. Special-purpose ordnance will include big-arse grenades and a rocket launcher for those situations were lots of indiscriminate damage are needed right now. Gaige isn’t trained to use any of those, but who cares ? The point is just to get some freakin’ big explosions. Whatever. Deathtrap (formerly “Project DT” or “Mechanised Anti-Bully DeTerrent”, formerly D374-TP) is a digistructable killer robot. “Digistructable” since it can be assembled from thin air in fractions of a second ; “killer” since it, like, kills stuff. The systems and batteries to digistruct and manage the robot are in Gaige’s cyber-arm. Deathtrap is legless humanoid. It floats off the ground, and can move around very quickly and make big leaps to reach its targets. Deathrap is well-armoured, and can generate large energy claws from its hands. If it cannot melee a target (usually because it is flying), D374-TP will fire its lightning projector instead. The attack is less powerful but it practically never misses. Gaige is working on allowing Deathtrap to throw the horns (and presumably headbang). Up the irons ! . This short official video presents all of Gaige’s possible abilities, though the electrical ones are not used in the build described in this profile. Gaige is from the planet Eden 5. Her father (or perhaps both her parents) was an inventor, and Gaige turned out to be a prodigy at engineering. Even as a teen, she could invent, program and build an artificially intelligent robot with much more firepower than common commercial robots. And AWESOME energy claws. And skull decals . With the encouragements of her ridiculously supportive dad, Gaige entered a planetwide school science fair competition. She brought both her combat tech prototypes and a brand new project, a sort of bodyguard robot to deter bullies. Very excited about her robot project, Gaige hacked off her own left arm to replace it with a cyber-arm she built. The arm could conveniently hold and power all the robot’s support systems. Her archrival Marcie entered the competition. Though she was significantly less gifted she was much, much richer than Gaige. When that proved insufficient, Marcie stole Gaige’s anti-bullying designs and turned them into a boring corporate secbot proposal. Without AWESOME energy claws or skull decals. Gaige went ballistic. She rebuilt her bully deterrence robot into a death machine she called Deathtrap. Presumably because of her mad scientist instincts. Whatever. Gaige was quite successful during the fair, and the most likely winner. However, she was given but a measly third place. According to Gaige, Marcie had bought the judges panel. A fight erupted after the results were announced, and Gaige’s rival shoved her. The nearby Deathtrap robot intervened based on his anti-bully programming – but using the newly-installed weapons. Gaige was arrested for the manslaughter and resultant chaos. She would obviously have the book thrown at her for killing the child of a highly-placed corporate executive. Her only chance was in escaping, and her father arranged for a diversion that allowed Gaige to flee Eden 5. The big news in the tech world were the eridium mines that Hyperion had established on the planet Pandora. This new element could be used for some revolutionary weapon designs (and presumably other things but heh, *guns*. So, whatever.). Pandora was also known for its lack of corporate authority. It was generally lawless and in-between Atlas Corporation and Hyperion Corporation control. Thus, Gaige fled to Pandora. On one hand, the eridium rush on Pandora, and the erroneous rumours that a new vault full of alien technology had been found, attracted many other adventurers. This helped Gaige avoid detection after she landed. On the cyber-hand, Hyperion was determined to destroy anything interfering with its efforts. Thus, ruthlessly sociopathic Hyperion CEO Handsome Jack had most would-be Vault Hunters murdered. With her keen interest in eridium tech, Gaige ended up being on the list. Hyperion forces killed the bulk of wannabe Vault Hunters without much of a problem. But a half-dozen hardarses proved way harder to kill – including Gaige. To get rid of those, Handsome Jack set up a devious trap. He lured them aboard a train which then exploded in the glacial Windshear Wastes. It didn’t work either. But Handsome Jack had other plans — not to mention a pony made of diamonds. Gaige runs around in what was apparently her school uniform. It includes a red T-shirt and red skirt, with a fitted leather jacket thrown on top plus tights with big horizontal stripes. It’s now damaged. Furthermore, Gaige has made some alterations such as drawing a death’s head on the front of the T-shirt to look more metal, or slicing open one side of the skirt. She wears shorts underneath, obvs. With modern technology, she can easily change the colour of her eyes, hair and clothing to whatever looks more metal. Gaige speaks with a nasal, high-pitched, rapid, highly excitable voice. She sounds more or less like a mouse on cocaine. But in an adorable — if deranged — way. She is voiced by Cherami Leigh . 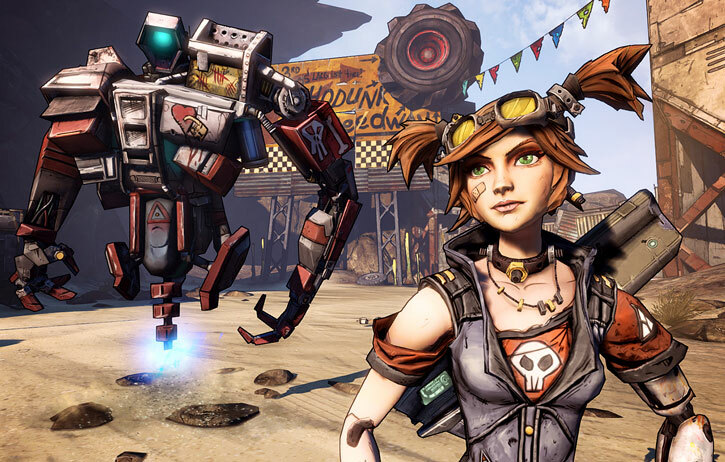 Here are Gaige’s podcasts about how she arrived on Pandora. ESL speakers, please note that she talks real quickly. A mad scientist (well, engineer) who happens to be a teenage girl. Gaige is very proud of her tech, and consummately irresponsible and unreasonable in how she uses it. Like most characters in the setting, she is unempathic, her sanity is frayed, and she considers violence and slaughter to be more fun than a barrel full of monkeys. Gaige is enthusiastic and very excitable. She speaks like a typical nerd on the Internet. For instance the word “awesome” constitutes an important percentage of her language, and she uses various video games references and Internet memes. She also adores everything that is “metal” and/or “badass”, and has a certain punk-rock sensibility. She’s a teenage anarchist. Though her understanding of these complex ideologies seems minimal and she’s more about yelling simple slogans, the post-cyberpunk world she lives in is so ridiculously authoritarian and dysfunctional that it’ll do. Despite her denials, she loves hot cocoa. Credentials (Free access to the Catch-A-Ride network), Expertise (Robotics, High-tech infantry gear), Lightning Reflexes, Schtick (Lightning Reload). Age (Young), Mistrust, Minor Rage, Misc. : Gaige has a 1 AP body weight. ANARCHY SYSTEM [BODY 01, Enchantment: 02. Enchantment increases the EV of Gaige’s gun ; she can engage 1 AP after 3 Phases of shooting or reloading, and 2 APs after 7 Phases of shooting or reloading. Each AP of Enchantment active reduces Gaige’s AV with her guns by one per AP of Range]. COOKIN’ UP TROUBLE SYSTEM [BODY 01, Regeneration: 02, Note: Regeneration applies to both Gaige and the CYBER-ARM]. 4 APs for cramped quarters. 3 APs for a large corridor or a small room. 2 APs for spacious indoors. 1 AP in an open area. MODIFIED ORB SHIELD [BODY 02, Blunting: 12, Damage capacity: 12, Skin armour: 06, Advantage: Damage Capacity regains one AP of Current Condition at the end of every Phase where Gaige has not been hit by an attack *and* every time she downs an opponent, Limitation: Skin armour only vs. fall damage]. Jakobs coach gun [BODY 04, Shotgun blast (Range 01): 08, Ammo: 01] and a bazillion spare shells. Torgue gyrojet assault rifle [BODY 03, Projectile weapons (Area of Effect 0 APs): 07, Ammo: 10, Drawback: the projectiles are too slow to hit anything moving with 2+ APs of speed, and defensive OV bonuses such as Laying Back or Dodging are increased by +1 CS] and three extra clips. Electrocution grenades (x4) [BODY 01, Lightning (Explosive Radius): 08, Grenade Drawback]. Dimensional Travel only for Travel, and represents digistruction. The same ORB SHIELD as Gaige. 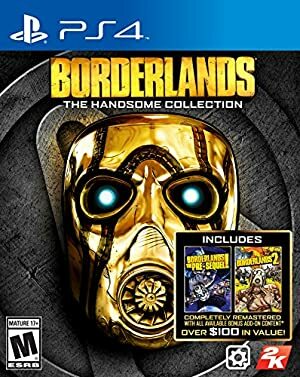 Source of Character: Borderlands 2 video game.